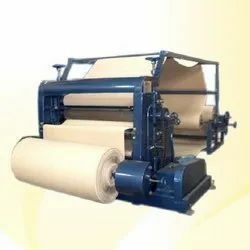 We manufacture world class range of high precision and robust paper corrugation machines that are widely demanded in national as well as international market. 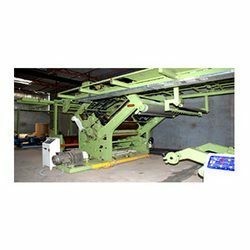 Our range of machines are fabricated using finest quality material that ensures corrosion resistance and durability. Designed using advanced technology, these machines offer enhanced efficiency and high rate of production. Further our range is available in different sizes and specifications and at most competitive prices. 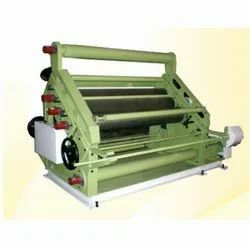 Paper Corrugation Machines mainly use in Cardboards and Corrugated box. Real-Time Production - These machines allow you to make the boxes of the required size in real-time. This makes it easier to manage the task in-hand and also helps you in working efficiently. Enhanced Customer Satisfaction - You will be able to deliver much better and suitably sized boxes, and this will help you enhance the customer satisfaction. 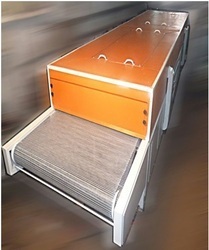 Minimized Environmental Impact - Without this machine, you are creating boxes that are too large for the products. Use corrugated box making machine to minimize this excess material. Our company is widely recognized as one of the most reliable Corrugated Box Making Machinery Exporters and Suppliers in India. 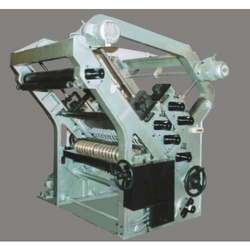 We offer Vertical Type Single Face Paper Corrugation Machine. Bush mounted for manufacturing 2 ply corrugated board, simple to operate with manual loading twin shaft reel stand. We are offering Automatic Feeder Machineto our clients. 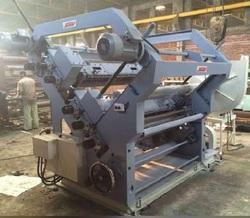 Oblique Type Single Face Paper Corrugation Machine with the latest Technology. Flute Rolls are minutely finished and mounted on spherical Roller Bearings, to give perfect impression on Board. With self loading twin shaft reel stand, And has more production capacity and efficiency than vertical type. 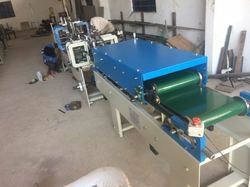 We are offering Double Profile Fingerless Heavy Duty Corrugation Machine to our clients. One Set of Flute Rolls ‘A’ 36 and one set of flute rolls ‘B’ 52 type or as per your requirement. Flute Rolls material Alloy Steel. Gum Roll & Gum Pipe is Hard Chrome Plated. Electric Heaters 3 Nos. with 15 Kw each & Pre Heaters- 2Nos with 4 Kilowatt each. 10 H.P Motor with Variable Speed A.C. Drives Siemens. Rewinding arrangement with 2 Nos. Rewinding Shafts. Control panel for synchronize with sheet cutter. 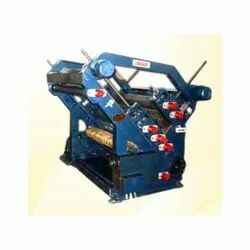 Double Profile Single Facer Corrugation Machine with 2 Set of Flute Rolls as Per your Requirement & Hydraulic lifting Roll Stand with Motor & AC Drive Complete. Electric Heaters 5 Nos. with Pre Heaters- 2Nos. 15 HP Motor with Variable Speed A.C Drives Crompton. Rewinding arrangement with 2Nos Rewinding Shafts. Heavy Duty Self Loading Hydraulic Mill Roll Stand. 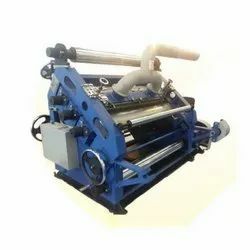 Fingerless Heavy Duty Single Facer Corrugation Machine with one set of Narrow Flute rolls, with, A/C Variable Frequency Drive (VFD) Motor with Blower system complete Set. 2-Ply board pass-out by vacuum suction method, with blower control system. Bearing of corrugated and pressure roller are having high temperature lubricate grease. Individual drive box ,separating dynamic oscillating improves running stability. Main Bearings, lubricated with high temperature grease. Provide outstanding sealing performance and reliable lubricating. Flute Rolls, the main part of this machine is very minutely finished to give perfect impression on the board. Motorized self loading twin shaft reel stand with three unwinding shafts helps in easy operator saving time. 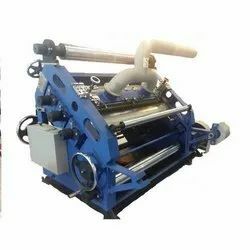 Two Profile High-Speed Single Facer Paper Corrugation Machine is a bod Nes Design, it offers high rate of production and enhanced efficiency. The rolls anr mounted on roller bearing for smooth rinning and longer life, minutely finished Flute Folls result in pergect formation of Flutes, Lubrication system based on high temperature fluorinated grease which solves a long standing industry provlenwith recirculating oil lubrication system, with elimination of lubricating oil system, the wastage of oil and leakage on the floor is prevented. Two Pre Heaters are provided with the Machine. 62" 120 ft 11 H.P. 39 K.W. It is an Automatic Carton Folding and Gluing Machine for the manufacture of cartons in the packaging of Pharmaceuticals Products, Food Stuffs, detergents and many other products. Highly versatile, dependable and capable of making a large range of cartons, with tuck-in type or automatic lock bottoms. Corrugated Box Dryer (Conveyor type) is a continuous penetrating flow drying equipment applied for drying Boxes, Corrugated Sheets, pieces strip and particles state materials with good ventilation. The machine is suitable for the materials such as dewatering vegetable, herbal medicine of traditional Indian medicine and others, for which the water contents are high and high drying temperature is not allowed. The machine owns the advantages, of fast drying speed, high evaporation capacity and good product quality. The Sheets and Boxes are uniformly distributed on the mesh-belt by the operator. The mesh-belt generally adopts 12-60 mesh stainless steel mesh and it is drawn by a transmission device and move inside the dryer . The dryer is composed of several sections. For each section, the hot air is circulated separately. Part of exhausted gas is exhausted by a special moistureexhaust blower. The waste gas is controlled by an adjustment valve. The hot air passes through the mesh-belt covered with bring water material away. The mesh-belt moves slowly, running speed can be freely adjusted according to the material property. The final products after the drying process will fall into the material collector continuously. The top and low circulation units can be freely equipped according to the user's requirements. The number of section might be selected according to the production demands. 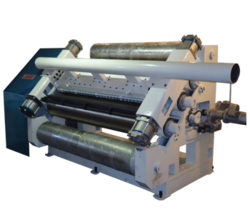 We are offering Fingerless Type Single Facer Corrugation Machine to our clients. Drive reducer box with oil immersed type lubricating to reduce noise keep running stable. Adopt gimbal transmission. separate power. Corrugated roller, pressure roller and glue roller by pneumatic adjustment. Cardboard transmit adopt vacuum suction method, with wind control system. Keep flute profiles stable of the lower roller in the condition of running up. Bearing of corrugated and pressure roller adopt high temperature lubricate grease. The Upper Lower corrugating roller are made of 52crMo high quality alloy steel, after heat treatment. The hardness HRC58-60, The surface be grinded. The glue part surface are treated by special mash snicked and chromeplated. 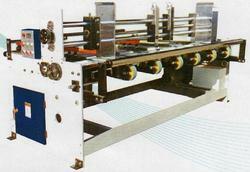 Motorized or manual glue width dividing to match the paper width. Glue part can be running independently or non independently while stopped. We are offering Single Facer Corrugated Machine to our clients. Main bearings, lubricated with high-temperature grease. Provide outstanding sealing performance and reliable lubricating, thin oil is optional. Looking for Corrugated Box and Board making Machinery ?